Researchers around the world have been trying to figure out the nature of abnormal rapid radio bursts that have spawned a mysterious object in a distant galaxy for 6 years already. In a dwarf galaxy located at a distance of 3 billion light-years from us, something is happening. 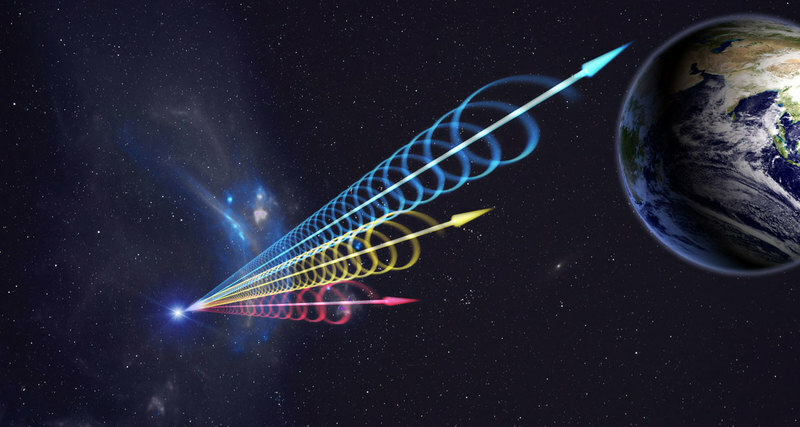 Rapid radio bursts (FRB) have puzzled astrophysicists for many years, but a new study can help unravel the secret of the mysterious signals discovered in the universe. In a study published today in Nature and also presented at the 231st meeting of the American Astronomical Society, a consortium of international researchers working with radio telescopes around the world came as close as possible to explaining why the only known rapid radio burst is repeated so regularly. FRB are strong radio signals that last only a small fraction of a second, which were first discovered in 2012. Since then, astronomers have struggled to find an explanation for what can cause such a short-term, high-energy phenomenon. Then they found FRB 121102. FRB 121102 is a radiator of fast radio bursts and differs from all other analogues. Many FRBs seem to be single-shot, but this signal is repeated with a certain periodicity. This created ideal conditions for research, which allowed to localize and carefully study each signal. The prevailing theory is that it is neutron stars – the nuclei of huge stars that survive a supernova explosion – that create such outbursts. Judging by the duration and strength of the signal, the diameter of its source is only 10 km, which coincides with the radius of the neutron star. To some, such figures on the scale of space may seem insignificant, but you need to consider that this is a fantastically heavy object in which the entire mass of the star is compressed to the size of a small microdistrict. This region is penetrated by a strongly magnetized hot gas, which is often observed near black holes and can be a radiation catalyst. It should be noted, however, that this is just a working hypothesis. Many neutron stars turn into pulsars – they begin to rotate at a huge speed and emit strong radiation. Researchers believe that FRB 121102 can be a young neutron star locked in a cloud of gas and dust left over from a previous supernova explosion. This can be a “breeding ground” for fast radio bursts, as the star interacts with dust. However, not everything in this theory is so smooth. Pulsars usually emit waves as a metronome with a regular frequency, however FRB 121102 does this even though periodically, but not on a regular basis. For example, for 4 hours of observations astronomers could not catch a single radio burst, but for the fifth hour there were as many as 18!